April 17, 1907: Fr. Demetrios Petrides arrived in America from Greece. He went immediately to Philadelphia, taking charge of Evangelismos (Annunciation) Greek Orthodox Church in the city. One of his first acts was to write a letter to the Ecumenical Patriarchate recommending that a catechumen, Robert Morgan, be received into the Church and ordained a priest. This took place in August, and Morgan became the first black Orthodox priest in America. Petrides went on to have a distinguished, eventful, and admirable career in Philadelphia and, later, Atlanta, before dying of diabetes in 1917. Metropolitan Germanos Shehadi, erstwhile leader of the “Antacky” faction. He had come to America on a fundraising trip back in 1914, but when St. Raphael died the next year, Germanos decided to stick around and try to lead Raphael’s flock. Only a strong minority faction followed him, and this support virtually evaporated in 1924, when the Patriarchate authorized Victor’s consecration and the creation of a legitimate Antiochian Archdiocese. Bishop Emmanuel Abo-Hatab, Aftimos’ former auxiliary and, before that, the archdeacon to St. Raphael. When the Russian Metropolia pulled its support for Aftimios, Emmanuel jumped to the Metropolia himself, taking over Aftimios’ title as bishop for the Syro-Arabs. April 20, 1934: The early 1930s witnessed a lot of deaths of prominent Orthodox churchmen in America. Just one day after Abp Victor died, Metropolitan Platon Rozhdestvensky, the longtime primate of the Russian Metropolia, himself died. 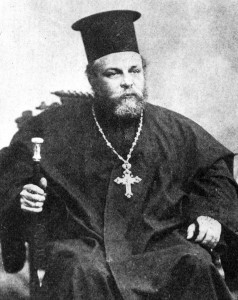 Platon had first come to America way back in 1907, as the successor to St. Tikhon as head of the Russian Archdiocese. He returned to Russia in 1914, but after the Bolshevik Revolution, Platon just kind of showed up in America again, this time as a refugee. The Russian Archdiocese already had a primate — Abp Alexander Nemolovsky — but Platon hung around for a while, until the embattled Alexander moved to Europe. Platon was Alexander’s natural successor, and it was under Platon that the Archdiocese morphed into what became known as the “Metropolia” — a de facto independent jurisdiction. Platon’s second American tenure was filled with endless legal battles with John Kedrovsky, an “archbishop” of the Soviet-backed Living Church. The Metropolia lost its cathedral, and ultimately had to accept the charity of the Episcopalians, who offered worship space in one of their churches. By the end of Platon’s life, any notion of the Russian Church as the platform for Orthodox unity in America was a faint memory. April 19, 1936: Exactly two years to the day after Abp Victor died, his successor was consecrated. Or rather successors, plural. On the very same day, two men, representing two Antiochian factions, were consecrated in different cities. Metropolitan Antony Bashir was consecrated in New York and took charge of the largest portion of the Antiochians. Meanwhile, in Toledo, Ohio, several Russian Metropolia bishops consecrated Metropolitan Samuel David. So now, instead of the “Russy” and “Antacky” factions, you had the “New York” and “Toledo” Archdioceses. This division persisted for almost 40 more years.